YCRC Juniors at BRIC 2017. 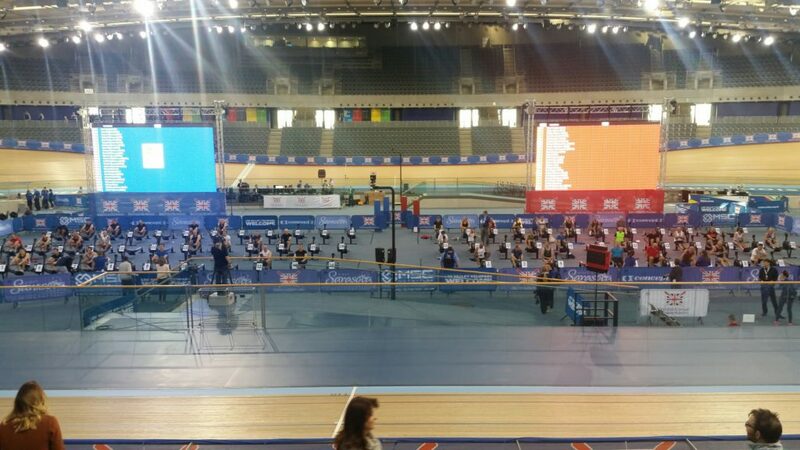 On 9th Dec Astrid and Maximus travelled to the Velo Park and the Olympic park in London to compete at the British Indoor Rowing Championships together with over 2,100 other competitors. Maximus competed in the J13 category which meant 3 minute ergo race. He finished 12th out of 21, an amazing achievement in his first rowing competition. Astrid raced in the J15 category, taking on the 500m race where she finished 16th as well as the 5 mins race where she finished joint 11th out of 71. Maximus in his race at BRIC 2017. Photo: Y. Mawle. It was a fantastic experience shared with GB Olympians and Bradley Wiggins. Competitors had an age range from J12 to 91 years old from rowing club members to individuals who just ‘wanted to give it a go’. There were big screens so each race could be followed with distance, time and placements and great commentary so it was very exciting to watch. If you are an ergo fan or just want to do something fun and different, BRIC is highly recommended. Competition enclosure at BRIC 2017. Photo: Y. Mawle.